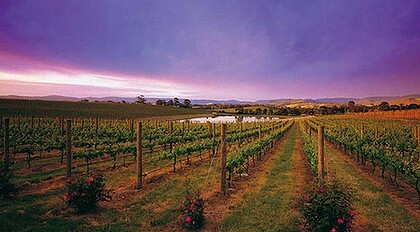 Established near Seville in Victoria’s Yarra Valley in 1978, Oakridge Wines began as a family company. The turn of the century saw Oakridge move to its location in Coldstream, and become a part of one of Australia’s larger wine companies. In recent times, Oakridge once again returned to family ownership. As the valley varies in altitude from 50-450m, it makes possible the potential to ripen dissimilar grape varieties. Every 100m increase in elevation corresponds to a drop in temperature of 1°C. This is why full bodied reds can be successfully ripened on the valley floor, while delicate and aromatic wines can be sourced from the higher reaches. Harvest typically commences in early February with Pinot Noir and finishes with Cabernet Sauvignon in early April. These dates correspond to September and November respectively in the northern hemisphere. Frost is rarely a problem, but can affect the lower vineyards on the valley floor from time to time. With a seven month growing season, rainfall of between 750-950mm (often less rather than more) and restricted water holding capacity in some soils, irrigation is considered essential – although the extent of its use does vary significantly between producers. The Oakridge 864 wines are the family owned vineyard's premier wines. 864 are single vineyard, produced in small quantities. This Shiraz was very enjoyable indeed and somewhat unusual. The Yarra valley's relatively cool climate means that the best wines have plenty of complexity and avoid being overpowered by alcohol. This 864 was almost Pinot noir like given the intensity and complexity of flavours. Cedarwood, plum, cherry, cranberry with a ultra long finish. There is a also a lovely herbiness and spice.